This product is no longer available and has been replaced by: CMP3-L. 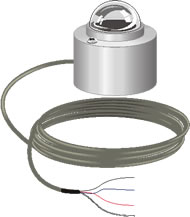 The CM3 is a rugged pyranometer manufactured manufactured by Kipp & Zonen. It measures solar radiation with a high-quality blackened thermopile protected by a dome. The blackened thermopile provides a flat spectral response for the full solar spectrum range. The flat spectral response allows the CM3 to be used under plant canopies or lamps, when the sky is cloudy, and for reflected radiation measurements.